The liberal media conspiracy must have had a secret meeting on the cafe car of the Acela sometime in the past week or so, because there’s been a sudden flurry of pieces revisiting the matter of Mitt Romney’s Mormon faith and urging him, in one form or another, to be more open about it. What’s surprising to me is that none of them mention what is surely one of the primary reasons that Romney has been reticent in this area. In Romneyland, Mormonism is the religion that dare not speak its name. Which leaves him unable to talk about the very subject he seems to care about most, a lifelong source of spiritual, familial, and intellectual sustenance. We’re used to politicians who camouflage their real views about issues, or who practice fraud in their backroom financial and political deal-making, but this is something else. Romney’s very public persona feels like a hoax because it has been so elaborately contrived to keep his core identity under wraps. There are valid reasons for the rest of us to home in on Romney’s religion, not in terms of its historical eccentricities but in terms of its cultural, psychological and emotional imprint on him. His aloofness, guardedness and sporadic defensiveness: are these entwined with the experience of belonging to a minority tribe that has often been maligned and has operated in secret? Do his stamina and resilience as a candidate reflect his years of Mormon missionary work in France, during which he learned not to be daunted in the face of so much resistance that he won a mere 10 to 20 converts, according to “The Real Romney,” a biography published last month? ...Much of Romney’s problem traces to his inept handling of questions about his religion. He has managed to reinforce the image that many voters already have of him, namely that he’s a moving target, a wind-sock politician who adjusts his positions according to the prevailing political breezes. When asked about his faith, especially during the 2008 primaries, Romney’s stock answers were, “I’m not a theologian” and, “I don’t speak for my church.” Both responses may be accurate, but they belie his deep involvement with the Church of Jesus Christ of Latter-day Saints, as a bishop and “stake president” (both volunteer assignments) and as a major contributor (to the tune, apparently, of millions of dollars). Not only does his caginess reinforce his image as evasive, his reticence about his faith reflects Mormonism’s lack of openness. These writers, like plenty others, cite as Romney’s main reason for reticence the lingering anti-Mormon bias among many voters. But it seems to me there is another, more conventional factor at work: the country’s lingering complex with the “what did you do in the ’60s” question. If Romney were to be more open about his Mormon background, a natural place to start would be in talking more about his two and a half years as a missionary in France in the late 1960s, a formative period in which Romney survived a life-threatening car crash and discovered his talent for leadership. Bruni urges him to talk about this period as a way to remind voters of a time when he really struggled—after all, proselytizing on behalf of Mormonism in a land of wine-loving Catholics is no easy thing. Romney ventured into this area two months ago, but only in terms of joking about the plumbing-related deprivations of life in France, a riff that was undermined by reports showing that he had lived out his final months in a stately mansion in Paris. Why not make more of these years when he was facing constant rejection in a strange, protest-riddled country, separated from his sweetheart who, he feared, was falling for another man at Brigham Young University? Why not turn the 30 months in France into a formative chapter equivalent to Barack Obama’s short stint as a community organizer on the South Side of Chicago? Well, it should be obvious why not. Yes, partly because the notion of young missionaries in suits going door to door is discomfiting to the many Americans who are prone to turning off the lights at such an approach. But also because ... there was a war on! Romney’s trying years in France spared him the risk of some far, far more trying years in former French Indochina. As The Real Romney, the new Romney biography by two Boston Globe writers, recounts, Romney received a 4-D draft exemption as a “minister of religion or divinity student” that protected him from the draft from July 1966 to February 1969. The Mormon exemptions became more controversial as the war in Vietnam escalated, with some non-Mormons in Utah filing a federal lawsuit against them in 1968. When Romney’s deferment ended, he drew a lottery number that ensured he would not be drafted. And Romney, who kept his distance from the anti-war protests that were starting up at Stanford before he went to France, has been characteristically all over the map talking about his deferment in the years since. “I was supportive of my country. I longed in many respects to actually be in Vietnam and be representing our country there, and in some ways it was frustrating not to feel like I was there as part of the troops that were fighting in Vietnam,” he said at one point. But at another point, he said, “I was not planning on signing up for the military. It was not my desire to go off and serve in Vietnam, but nor did I take any actions to remove myself from the pool of young men who were eligible for the draft.” Which of course isn’t really accurate—he did take actions to remove himself from the pool, for 30 months. He went to France. But regardless of what he thought of the war, he had managed to avoid it. Just something to keep in mind. 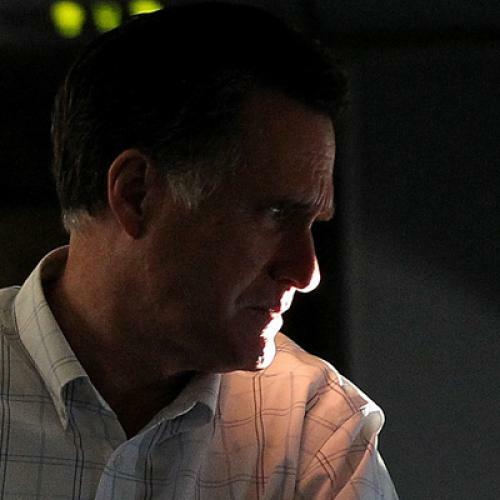 For Mitt Romney, talking about religion isn’t just talking about Mormonism. It’s also talking about Vietnam.